As mentioned the other day, I managed to pick up a Frary with Hammer, Spike, and Hercules-type frame the other day, and this was one that was on the wish list. 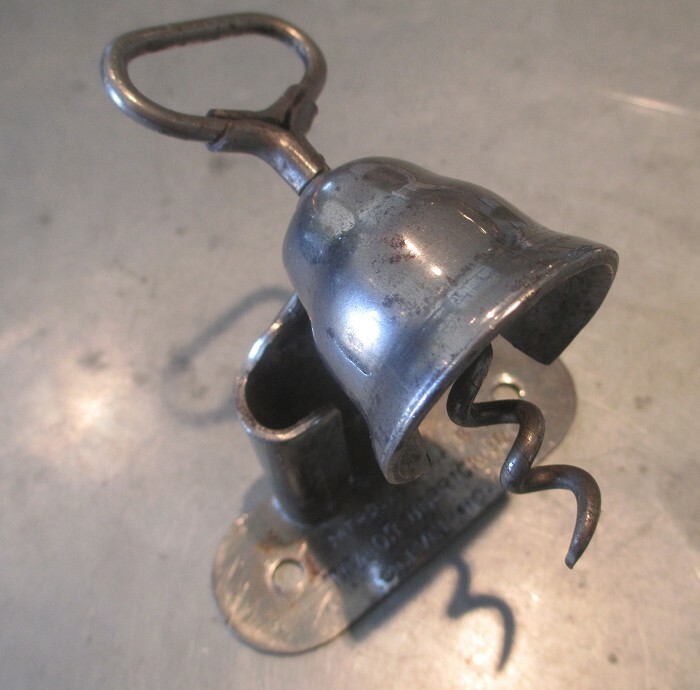 With this particular corkscrew crossed off the list, it is time to find a few more! 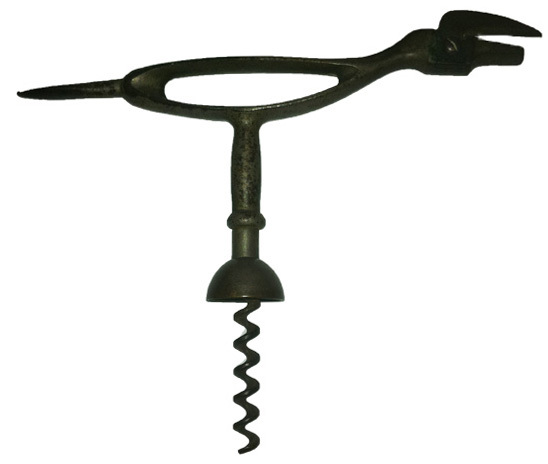 Frary Corkscrew with Spike, Can-opener and with or without the bell assist. 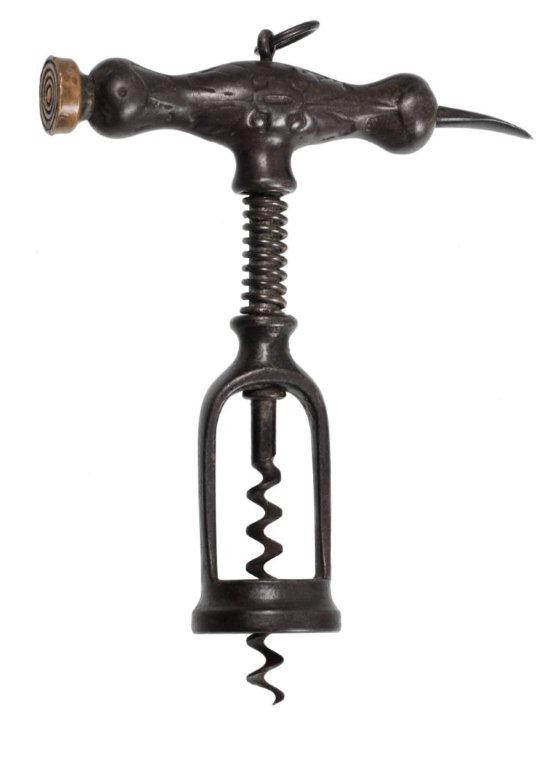 Frary Oblong handle Corkscrew with bell assist. Frary with Hammer, Spike, and Hercules-type Frame. 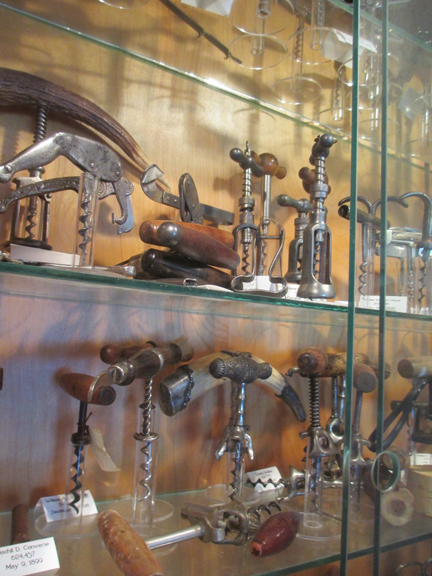 And, another Gundlach & Co, San Francisco Corkscrew as well. Nickel-plated or not, I have a friend who is looking. I have already added this one to the Frary Corkscrew page, if you would like to give it a look. 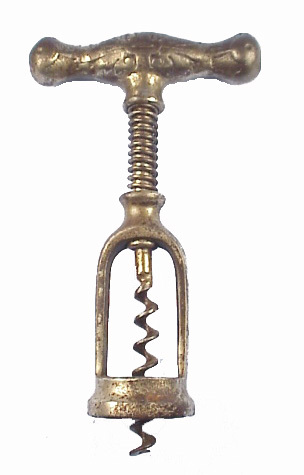 Of course there are plenty of other antique and vintage corkscrews on the wish list, so feel free to send pictures of any corkscrews you have to trade. I am sure I have a few extra laying around. Well, it was an exciting couple of days of ICCAuctioning; bidding wars, lack of bids, and being outbid by the usual suspects. And, I did manage to win one lot, not for a lack of trying on others. The piece that I most wanted was the double helix Barnes wire. I was indeed the high bidder on that for a while–and was hopeful, but soon enough other high bids surpassed mine, and while I even considered upping my price, it was already past what I thought was reasonable. And, it sat at 400.00 for most of the time it was listed, finally as the auction was winding down there was a second bid. Then another; a small bidding war ensued. 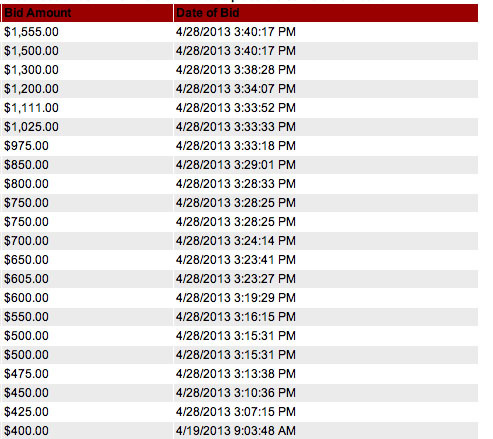 Going in 25 dollar increments, it has gotten up to 600.00. That was about where I expected it to end. Apparently seeing a small bidding war going on apparently peaked the interest of yet another bidder who soon jumped into the fray. And, when the Double Duty auction had ended, it was at the crazy price of 1555.00! As mentioned above, I did miss out on the Barnes, and while there are a couple of pieces that I might throw a bid at in next weeks listings, I did get the Samurai / Sterling Walker for a low price. I missed out on one of these some time back, and think it is a pretty cool piece. So, until the weekend when the flurry of bidding will gain commence, it is back to construction. The new glass exterior door is to be delivered today, and it will be an interesting task getting it to the second floor deck. I am thinking rope and several friends will be needed to help haul it up. If all goes as planned, the woodfloors will be in my the end of the week too! 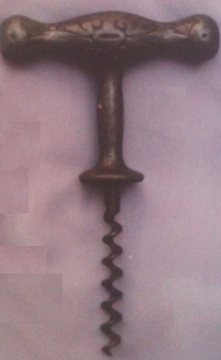 The other day, I posted a blog entitled “Finding Frary.” And, at the end of the blog, I included several images of Frary corkscrews that I would still like to add to the collection. And, as of yesterday afternoon, one of the Frarys on my wishlist was made available, and shortly thereafter a deal was stuck. 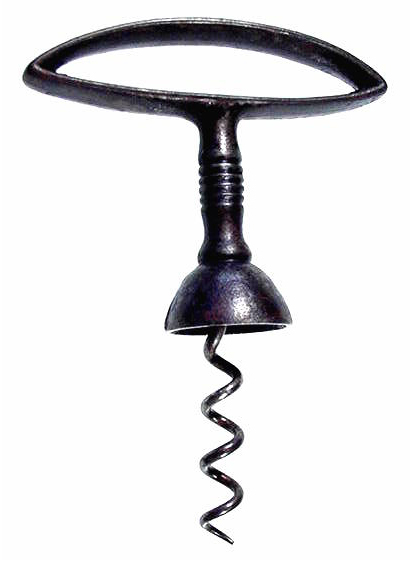 I was aware of a very similar corkscrew, but wasn’t able to acquire it. 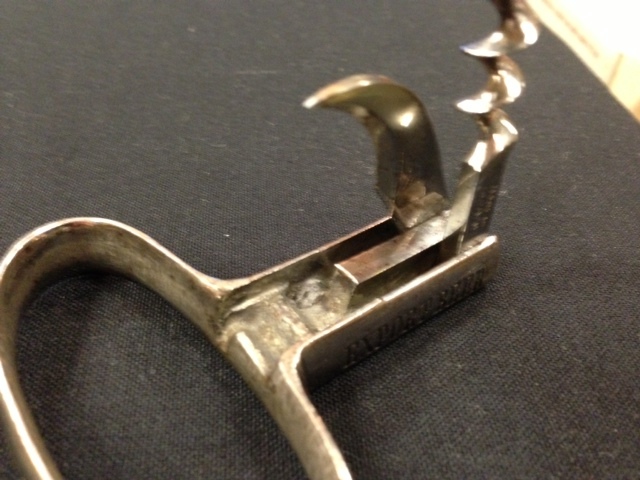 Originally, Don Bull emailed a picture of a Frary corkscrew that was in Howard Luterman’s collection. I emailed Howard’s son to see if it was available, and received a response several months ago that explained that it was sold to John Morris. I had called John to discuss our upcoming visit, and in our conversation he did explain that he had gotten a Frary from Howard’s collection. And, when I visited John earlier this month, I did see that Frary. So, on to my wishlist it went. 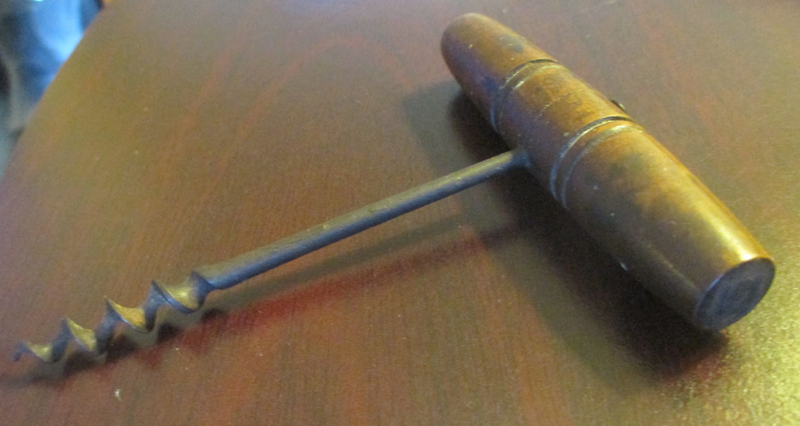 A decorative cast iron handle Frary with hammer and spike, atop a hercules type frame. 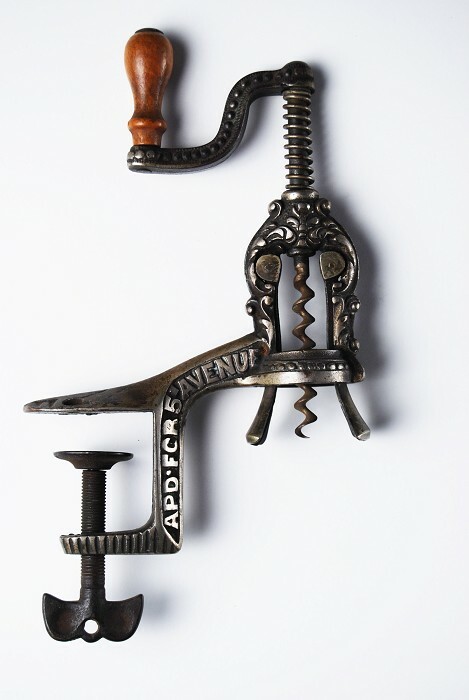 Or as Frary’s description from 1889 would have explained, a “Combined Corkscrew, Ice-Picker, &e.” At least, that is how he described his corkscrew with a similar handle, we don’t yet know how he would have described the hercules frame, but this would be the third variation with this frame that is in our collection. 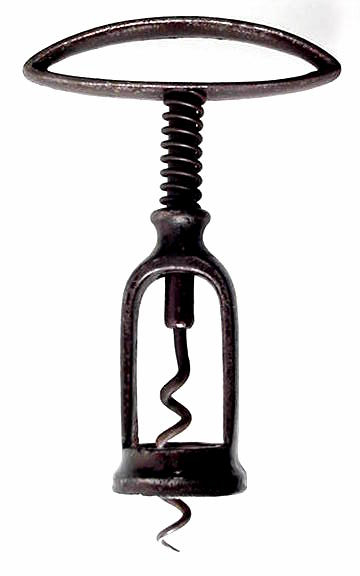 This corkscrew will surely make the best 6 for the year, and it brings the “Frary-ation” count up to 17. There are still a few more out there, and hopefully I will be able to track them down. In just a few hours, the first round of ICCAuctions will be ending. And, it seems like bidders are holding back until these last few hours to place bids. It will be interesting to see if there is a flurry of action as the time winds down, or perhaps there will be a few items that sneak through for a low price. I will definitely be placing some bids shortly!!! 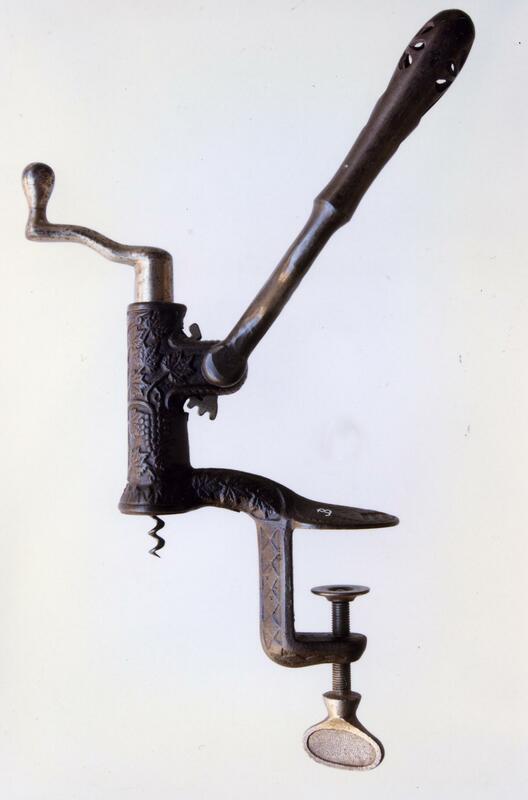 For those of you that have been reading this blog for a while, you are quite aware of my obsession with James D. Frary and the corkscrews that have been attributed to his company. And, for several years, I have been trying to hunt down proof that Frary was indeed the maker of those that were illustrated in Ken Cope’s book, Kitchen Collectibles: An Identification Guide. With Ken Cope having passed away some time ago, and no reference section/bibliography included in his book, finding out where the images came from was somewhat of a mystery. And, of course the other issue that lead to a few questions about Cope’s attributions is the lack of signatures on Frary’s non-barscrews, and the fact that there are some errors in his book. 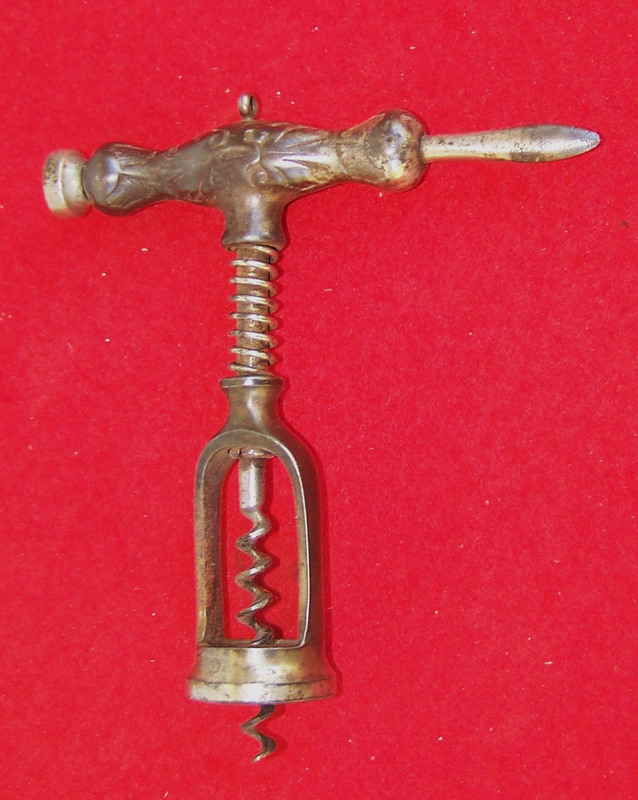 How do we know for sure that these corkscrews were indeed made by James D. Frary? 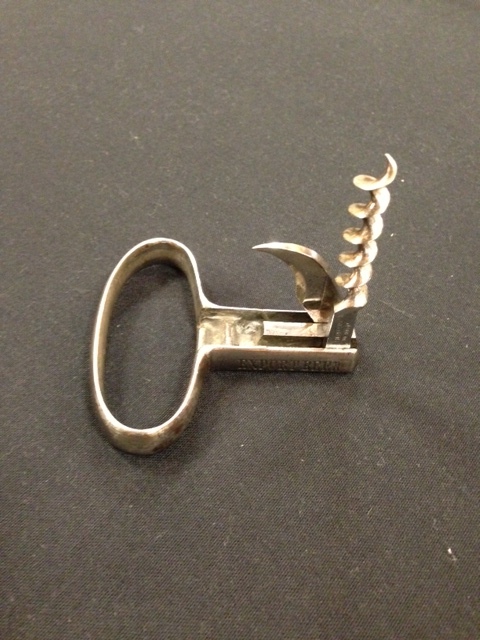 So, I turned to those who collect corkscrews that may have known Cope. In conversations with Joe Young, he explained that he remembered that Ken Cope did use a periodical entitled The Iron Age for some of his research. And, with The Iron Age not readily available online, or at my local library, the hunt continued. I managed to acquire a rather thick copy of 6 months worth of the weekly periodical from 1890, and there was nothing from Frary. 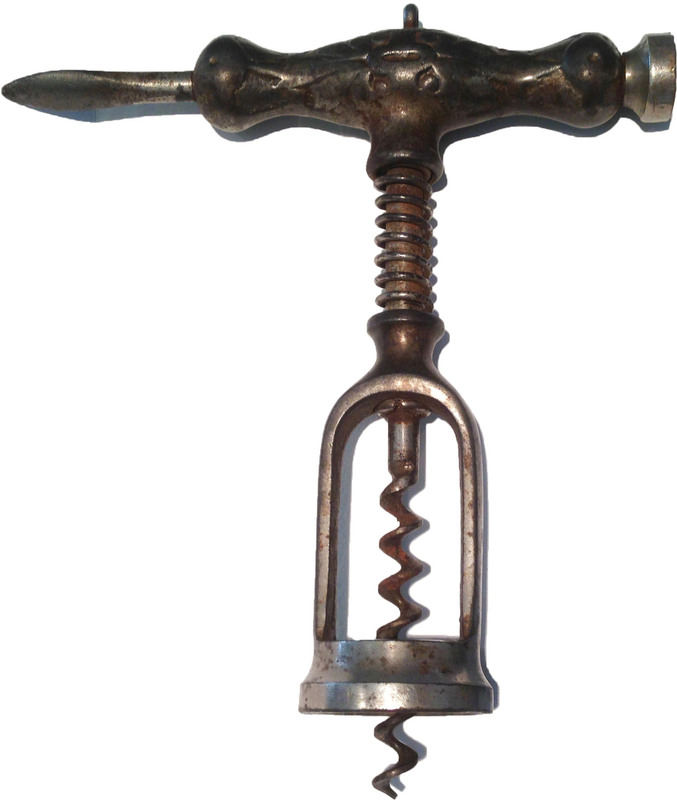 In fact, there were only a couple of corkscrews illustrated. Frary left Landers, Frary, and Clark in 1884. And, he died (according to various sources) in 1890. So…if the Frary information existed within the pages of The Iron Age, all I would have to do was page through 312 issues…and at approx. 220 pages an issue, that is just about 68,000 pages to turn. Having ruled out half of the available copies from 1890, I went back to searching online, to see if something would come to light. 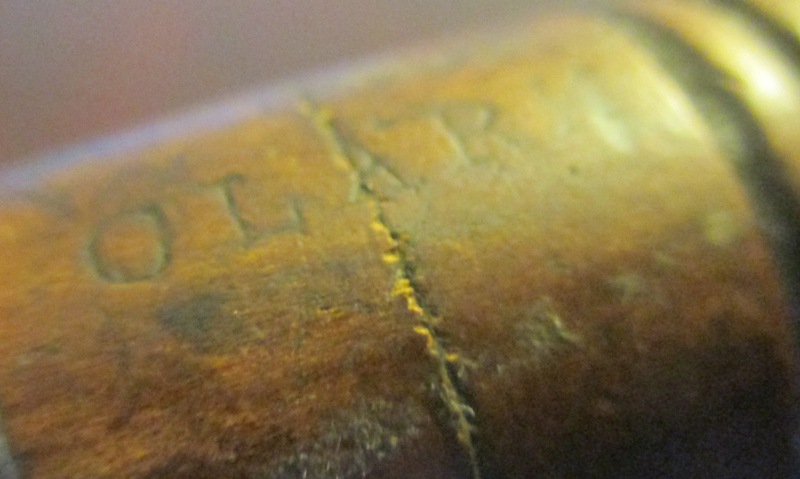 And, as luck would have it, a partially digitized issue of The Iron Age, had a reference for Frary and a Corkscrew! However, the entire issue of the periodical wasn’t available. Still, I now knew the issue to go after, but I was going to find the microfilm… And, living on the island, this was going to require a boat and long road trip. And, I didn’t want to wait. So, after doing a bit more searching, I did find several copies of The Iron Age available for sale online, but they were the wrong issues. Grrrr. Finally, after a little more e-sleuthing, I happened upon hathitrust.org, and there was the issue. And, there…was Frary! 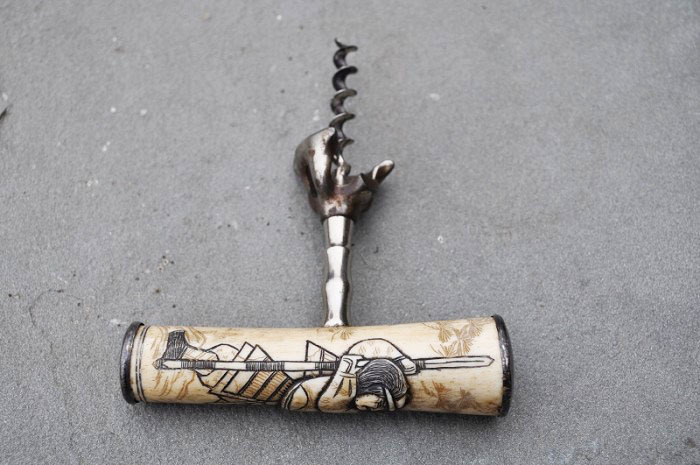 After going through the issue, I found multiple references to Frary and his corkscrews, and this information has now been published as an article on the International Correspondence of Corkscrew Addicts’ website, The-ICCA.net . For those of you that would like to also “Find Frary,” You can link to this article here. Of course, I am pretty much open to trade for any Frarys. 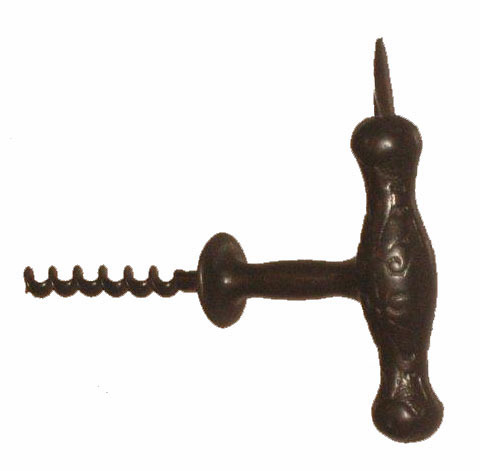 And, you can see the variations of these corkscrews on my Frary Corkscrew page. The last few days have been spent doing construction–not that most of my days aren’t spent doing construction–and so I have been spending little time online and much time upstairs on the master bedroom project. Still, I did peak at the ICCAuction listings, and have placed a couple of bids. And, the lovely bride and I did manage a little getaway from the island yesterday. We managed to pick up a couple cases of wine, and had a fun time hitting a few antique stores with one of our friends. 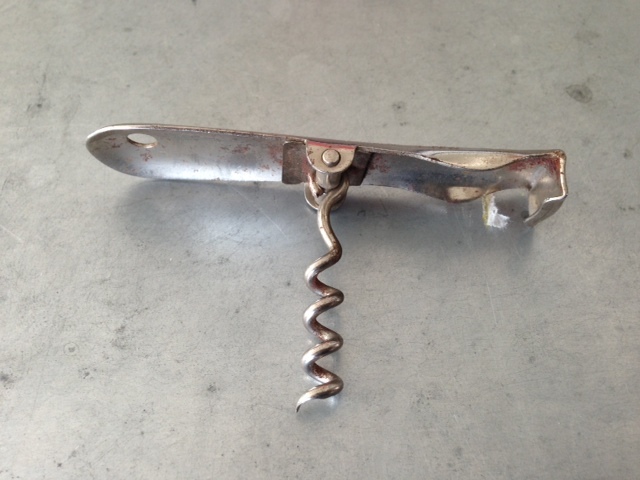 Not much in the way of corkscrews was found, but I did find an interesting Haff patent t-pull. Now, Haff patents may not really be blog-worthy, but I found this one interesting, as it was the first example of the Haff that I have ever found (and I have found many) that has the metal piece in the center of the handle that was unmarked. They always seem to have either the patent date or the patent applied for mark, and even those have multiple variations. And, it was in a 20% off booth, and cheap to start… So why not. And, in the same mall, I picked up a small bunch of openers which, also included an interesting over the top opener with corkscrew. Again, nothing earth shattering, but still a nice little corkscrew. 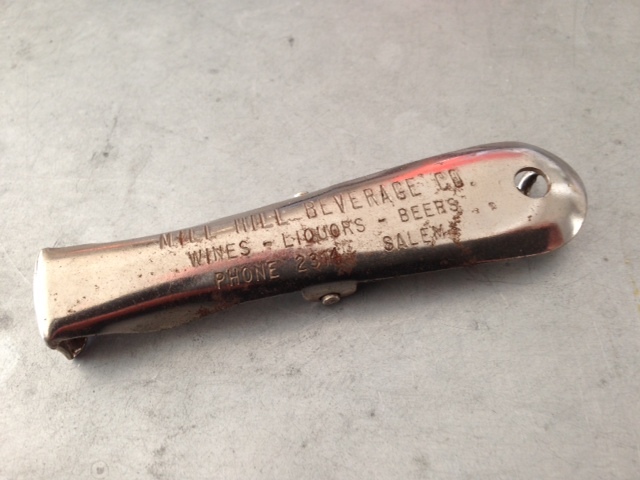 This one is marked MILL-HILL-BEVERAGE CO, WINES – LIQUORS – BEERS, PHONE 2314 SALEM. 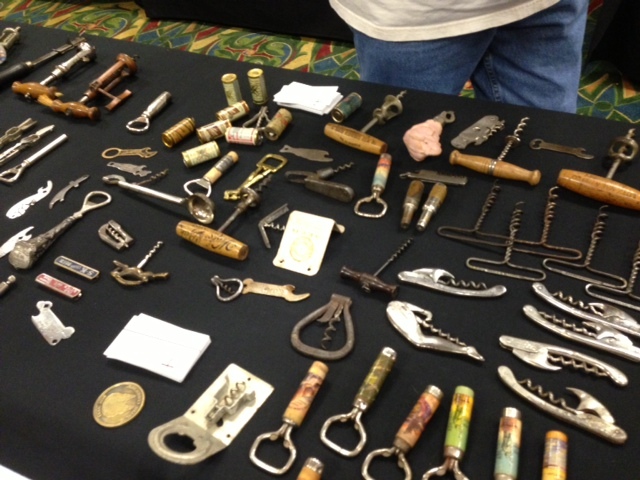 I should add that I did find about 20 other corkscrews, but they were either overpriced or common, and more often than not…both! We did also happen upon some libations and raw local oysters!!! Always a nice way to end a brief Sunday antiquing excursion!!! After a lovely homemade Pizza dinner with various wines (and vodkas–yes plural) at our friend Tad’s house, we hopped in the car this morning and started heading for home. 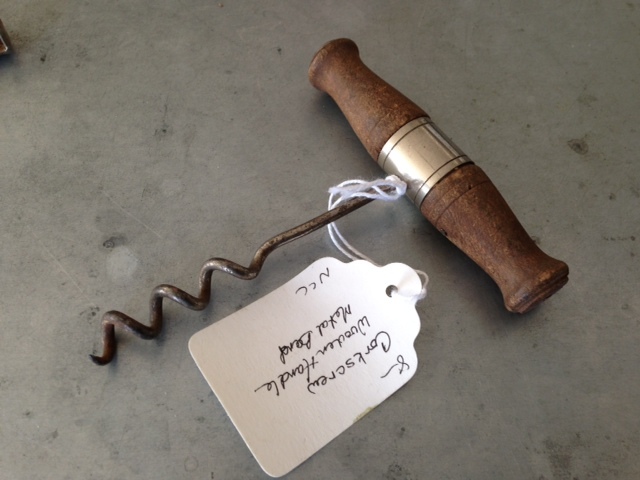 The latest round of corkscrew auctions on the ICCAuction, will be open for bidding as of tomorrow. 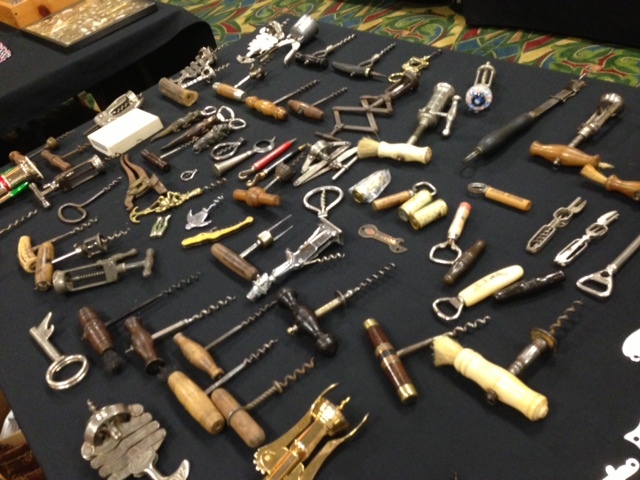 With 974 corkscrew lots available, there surely are one or two that will make their way into my collection. How many will be added to yours? You link to the listings here! Reading this, Tommy and I grabbed boxes of corkscrews and openers, and headed down to the appropriate room. After laying our stuff on the tables, we started to peruse other JFO’ers offerings. I managed to pick up a BUDDY-NIFE and a PAL FOUR IN ONE from the same person for a pretty fair price, and once back at my table made a few sales to various attendees. In the past, this has taken hours! With Tommy’s recent acquisition of the Hoegger wall-mount, I knew he really wanted by De Bracht patent wall mount. And, as I am not that attached to it, and knowing what a recent one sold for, I was willing to part with it if the deal was a fair one. 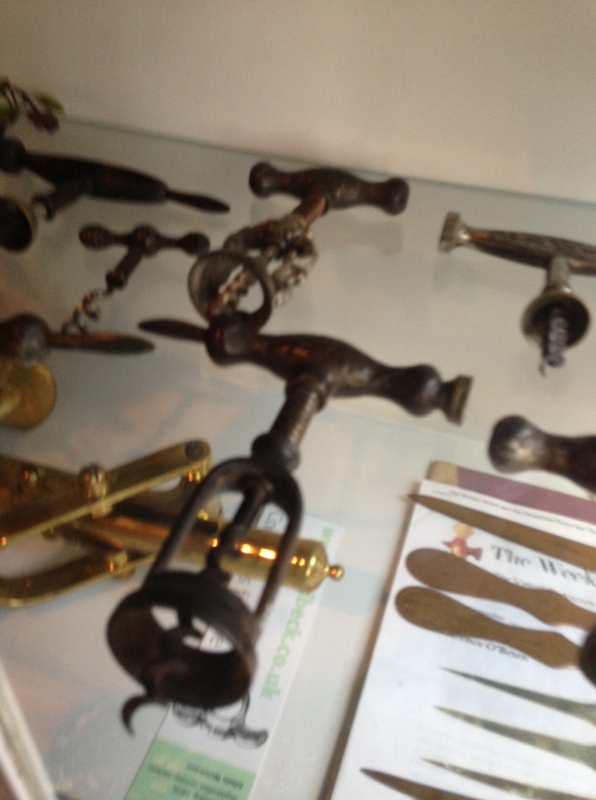 I placed the De Bracht on the table, and started to make a pile of corkscrews from his side. 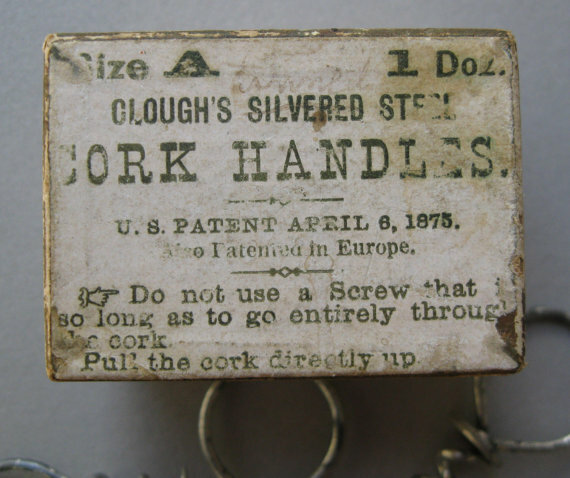 Eventually, there was a Walker patent peg and worm (that TWJ had been after all week), a Chicago beer corkscrew, and the De Bracht that were in Tommy’s pile, and I had a Mumford patent, Goodyear patent, and two different versions of the Moore patent sardine fork with corkscrew. I thought about it for a while, and then simply said deal. Tommy really likes the De Bracht, so why not. Shortly there after, TWJ came over, and Tommy struck a deal with him for the peg and worm. TWJ finally got his corkscrew, and Tommy got a Sunderland King and a little bit of cash. 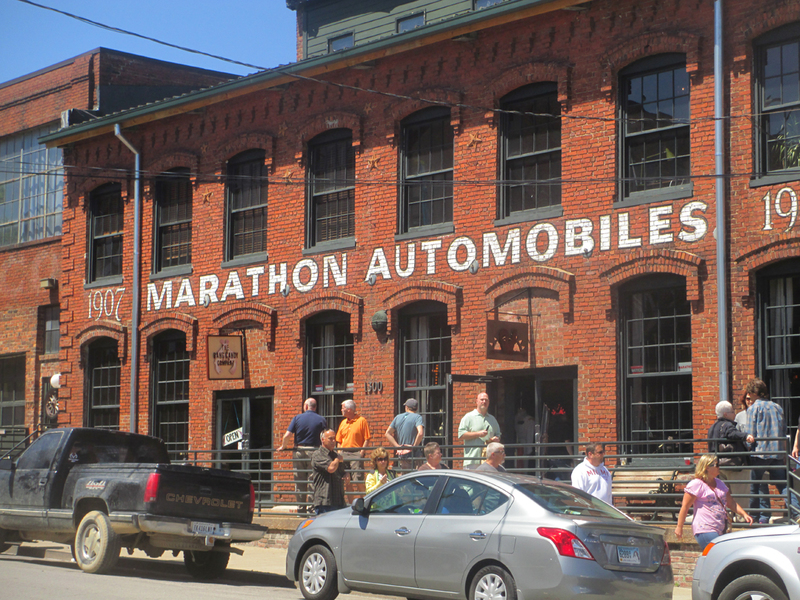 After we wrapped up the buy and sell, Tommy and I decided to grab some lunch, but headed over to the Nashville Antique Archaeology first. We meandered through the shop, and noticed that the main business of this location seems to be American Pickers’ merchandise. I know that this shouldn’t really come as a surprise, but their location in Iowa actually feels like an antique shop in the business of selling antiques. This one, not so much. Still, why not check it out. Following the AA visit, we stopped at a couple of antique stores, grabbed some lunch, and after a few more places picked up a nice Walker with a Tusk handle and sterling end cap. I am guessing it is Walrus, but perhaps Gary can chime in on this one. After visiting a couple more shops, we decided it was time to call it a day, as Tommy isn’t staying over, and is instead already on the road and heading for Chicago. A long drive a head of him, he will get some miles behind him before it gets to late, and then start again in the morning. As for me, I fly back home tomorrow morning, and will try to be back on the island by 4 pm. All in all, this was a great few days. Who knows what will happen next year? I will definitely be there, will you? Finally, TWJ has in his possession a really cool two-tooled folding bow corkscrew with beer advertising on it–the exact advertisement escapes me–but I am fascinated by the way it is put together. Check out this piece, and if you know anything about it, feel free to drop me a line. 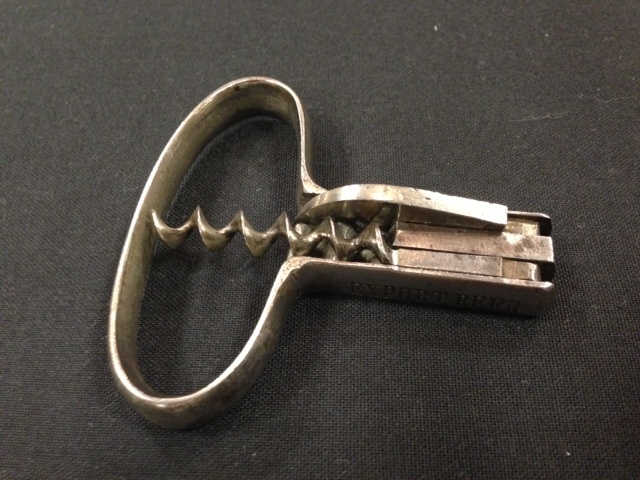 It is super cool, and since I can’t ever get the Rainier corkscrew from TWJ, perhaps next year I will manage to get this one from him. 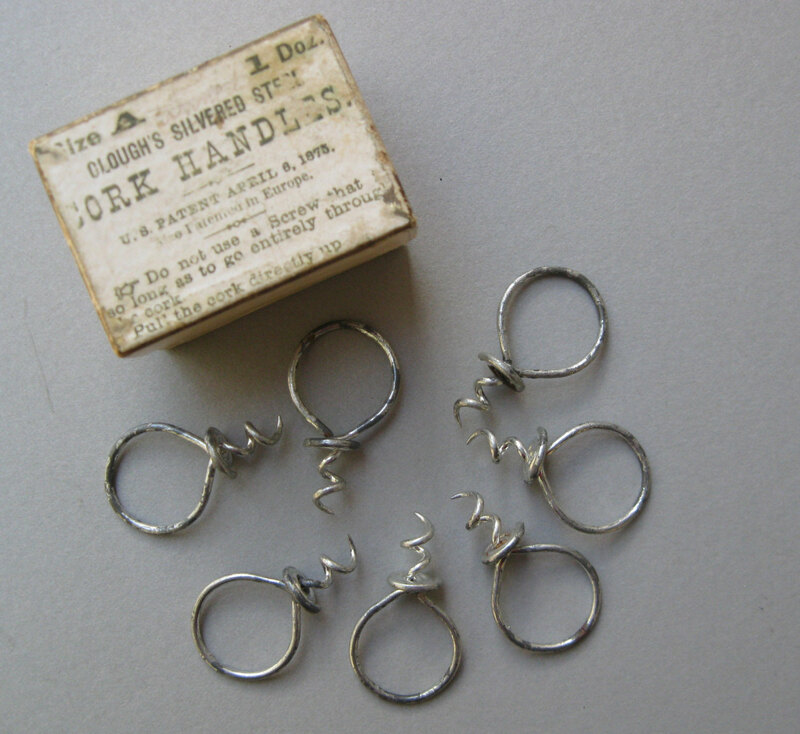 Yesterday, I picked up an interesting box of Clough corkscrews. U.S. PATENT APRIL 6, 1875. Do Not use a Screw that is so long as to go entirely through the cork. Pull the cork directly up. 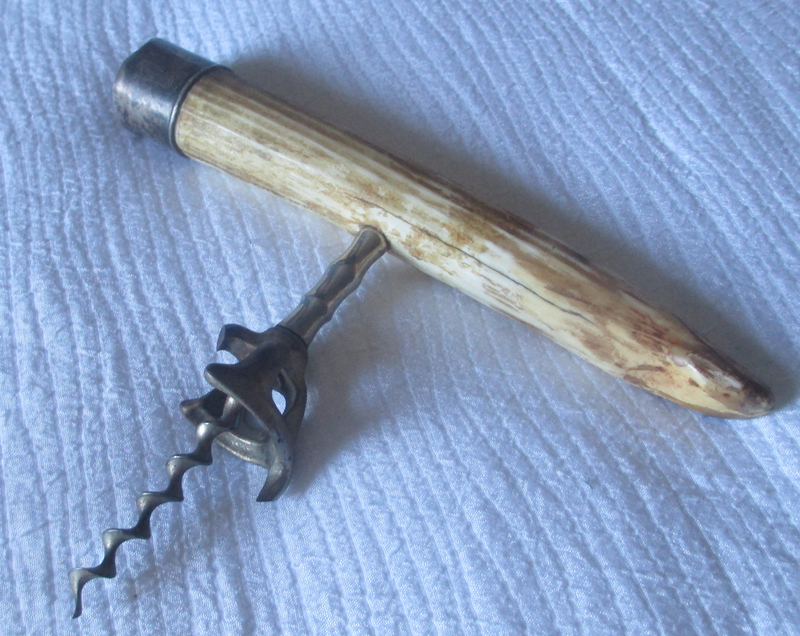 A cool little addition to the Clough “Cork Handle” collection! After battling with the hotel to provide a wireless signal, which they hadn’t until moments ago, Tommy and I hit the road. We started heading towards Chattanooga, and after a couple of brief antiquing stops, then made our way to Decatur, for a visit with John and Martha Morris. 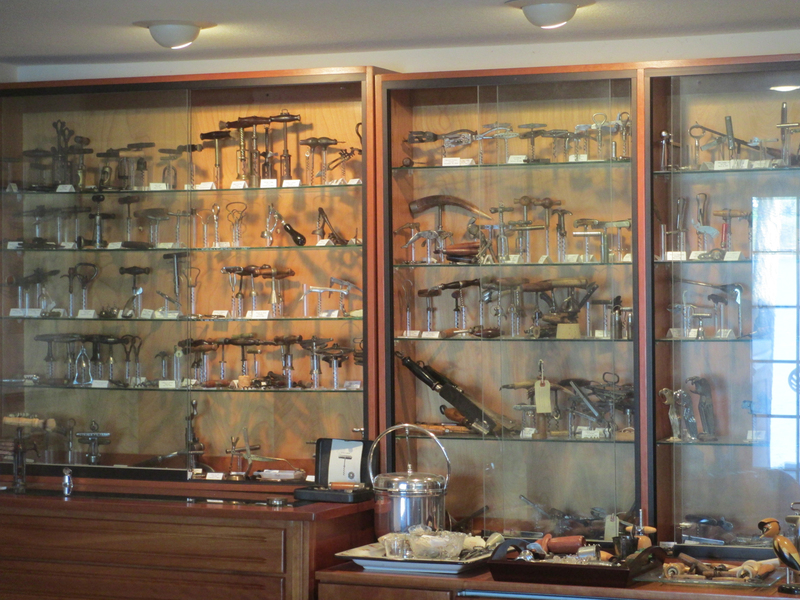 While I have been to John and Martha’s before, I knew that Tommy was about to be blown away by their corkscrew collection. And, after a short show-and-tell of items that we had brought with us, we headed down to the corkscrew room with libations in hand. 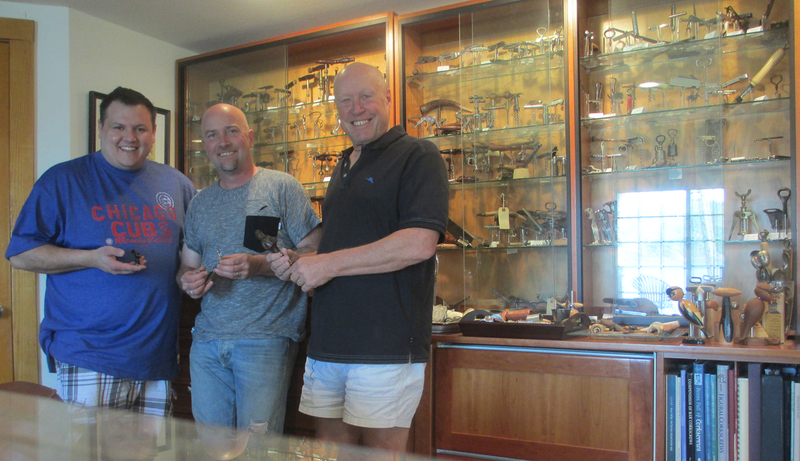 Visiting another collector’s collection is always a fantastic experience, and with John and Martha’s, combined with their wonderful hospitality it was an amazing time. Words really can’t do the collection justice, nor can pictures…but here are a few. Corkscrew viewing was followed by dinner with some great wines. The next morning, after breakfast, we ended up doing a little trading. I managed to pick up another Clark signed direct pull, and swapped a roundlet for an interesting beer advertising corkscrew. And, after a bit more negotiating, John picked up a patented can opener with corkscrew to add to his American patent collection. Tommy was in on the deals too, and ultimately came away with a great Hoegger wall-mount corkscrew, a few flashes (which were icing that John threw in, even though Tommy didn’t even ask for them) and a few other pieces as well. 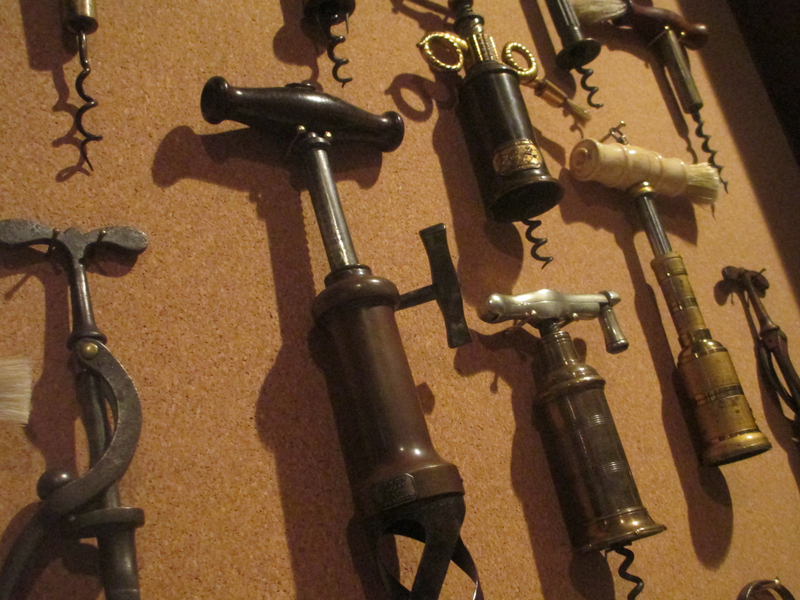 The stories were awesome, the company fantastic, and the corkscrews were simply stunning. After the trading session, we headed back up stairs, and before preparing to leave, Martha made sure we had lunch to take with us!!!! How cool is that. We are now back at the hotel, and as we were arriving the JFO auction was about to begin–where I picked up another Rydquist patent. Tomorrow will be some more trades, more antiquing, the show itself, and surely some more adventures.